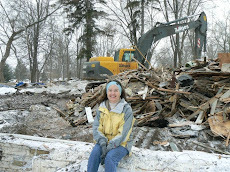 There are moments when I still can't quite believe that I actually tore down my old house and my very large detached garage. 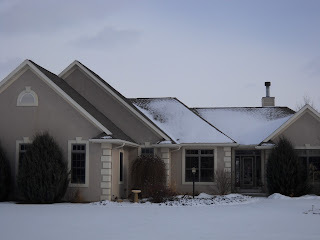 (It was the large garage, by the way, that actually convinced Rory to buy the property; once he saw the garage he said, "We've got to get this house!" The way to a man's heart is to give him a garage...). On the surface of it, tearing the house down was quite insane. On the tax rolls, the house and garage were worth about $120,000. However, there is an insanity to being in the depths of grieving, so I guess I will blame it on that. Having my husband die was a major upheaval, so I decided to keep going. I called Habitat for Humanity and they slowly dismantled what they could using volunteers to do the work---dimantling windows, doors, soffits, metal piping, sinks, bathroom vanities, faucets, light fixtures etc. They have store called "Restore" where you can find recycled house stuff. I had a very nice wood stove that they got, and some appliances. All told, I was able to claim a donation of about $18,000. Update: some blog followers wanted to know what happened to Oscar, the fish. Neither of the sisters whose homes I would be moving into wanted the fish. "No Way!" they said. I was so disappointed--my only housemate! It turned out that my brother-in-law, Terence Neilsen, was excited to hear this news. He gladly took Oscar. Oscar just barely survived the trip to Portage, WI. However, he revived and lived another year. Long enough to get even uglier and meaner (he would actually leap up sometimes and bite at the finger that fed him...quite in contrast to the old adage of "don't bite the hand that feeds you"). As I was making some edits to the blog (and I LOVE the fact that it can be edited so easily), I realized I needed to fill in some of the details of THE BEGINNING. 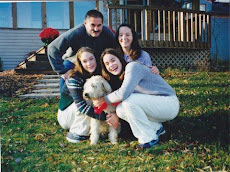 Rory had passed away in August of 2009 from liver cancer. As I mentioned in another blog, we had talked to a couple of builders, tossed around a couple of ideas about building a new house because he wanted a first floor bedroom and he wanted something that would be easy for me to take care of. I went to the Winnebago Parade of Homes in the fall of that year after he had passed. I was depressed, I needed something else to focus on. I was by myself. The economy was down. 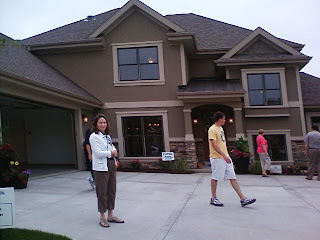 The majority of the builders who had homes that they were showing in the parade, were actually showing their own homes. 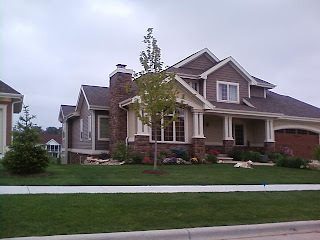 Home building was at a low point and there very few customer homes to show, at least here in Oshkosh. One of the parade homes I stopped at was the home of James (Jamey) and Billie Jo Mathusek who own Gallery Homes. It was beautiful; one of the best on the parade. 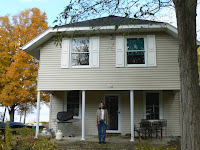 I had seen a couple other of Jamey's homes and I had loved those too. Jamey is both a carpenter and general contractor for his business. I was impressed with his work. Its kind of like having an artist whose work you like. However, I truly was at a low point of grief and was just going to pass through and leave; but, being a good salesperson, Jamey struck up a conversation. I told him I had a house I was thinking of either rehabbing or tearing down. He offered a great price per square foot if I built new. I said, "Will it be nice like your house?" He assured me that it would. So I left. I thought about. I struggled with the loneliness of the house every night when I would come home from work. The dog had died, too--in June of that year. So it was just me and a large, ugly 8" fish that Rory loved and who was named Oscar (i.e he was an Oscar fish, so that's what we had called him. He had started small but kept growing by eating up all of the other fish in the tank). As I thought about the winter ahead, I was afraid of all of the things that I didn't think I could handle--the cold house, the pipes that freeze in the kitchen in January, the snowblower that I didn't know how to work, hauling wood and starting fires in the woodstove (which I wasn't good at), and all the potential things that could break down. Worst of all, every inch of the house triggered some memory and some melancholy. So I made the decision. I went against the wisdom of many who say that after your spouse dies, you should not make any major changes for at least a year. I decided to build; and, to do that, I needed to move out. It took enormous effort, but through the next couple of months, I cleaned out every nook and cranny of the house. Everyone helped me to make the move--my inlaws, my family, my friends. On the final day, it was like Christmas. Rory's brothers raided the garage to snag up equipment and tools they knew I would never use, and my sisters and daughters grabbed things from the house. Many items went to a storage unit down the road. Good Will, Habitat for Humanity, the recycling places around town, and an ever burning bonfire in the back got the rest. It was a sunny Saturday at the end of November. 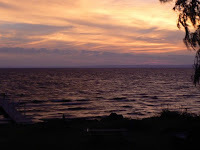 We ended by gathering in a circle by the lake, and saying a prayer of goodbye--to the house and to Rory. Before he died, he requested that his ashes go into Lake Winnebago. 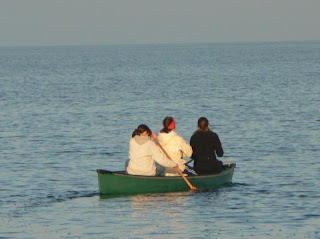 Caroline, Colleen and I, paddled out in the canoe to a point that is in line with the Jesuit Retreat House, and dumped his ashes.. As we did that, a small engine plane appeared in the sky above the persons left on shore and hovered above them. 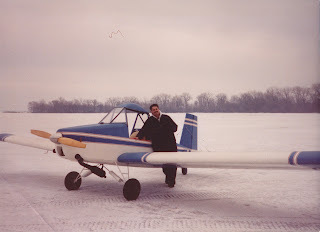 A reminder of Rory, who loved flying. When I started this project, and the my builder asked me what I wanted, I replied: "I want it to be beautiful and I want it to be green" (not referring to color). On the beautiful aspect of things, I echo the feelings of the main character in Pillars of the Earth by Ken Follett, which I just finished reading. It was a great book, especially for someone in the midst of a building project. The story takes place in the middle ages and is about all the effort, planning, patience and politics it took to build a cathedral at that time. When the bishop asked Tom the Builder why he wanted to build a cathedral, he said, "because it will be beautiful". I think that is a noble reason to build something--beauty takes us to a higher place, and is restful for the soul. I find that since my husband passed away, I long for those things that take me to a higher place, because I know that he is there too. On the other hand, I also want my house to be green. For me, part of that means that I would like my house to be powered by alternative energy sources. I have researched much along the way, hemmed and hawed, and find myself still debating about which way to go on this. The first thing I investigated was solar thermal. I saw an add in local natural health type magazine that advertised a company called Green Sky Energetics. I was still living in my old house, and the agent came out, climbed up on the roof and determined that I would have enough sunlight if a couple of trees came down. As it turned out, 2 of the pine trees that were blocking the sun needed to come down anyway when they dug the hole for the foundation, and the other one came down in a storm after I had torn the garage and house down (had the garage been there, the tree would have fallen onto the garage). Solar thermal is a system that uses the sun to heat your house. The panels are called solar collectors. They estimated my needing 8 solar thermal panels. When you have this system, you also have a 400 gallon collection tank in the basement. The sun heats the fluid flowing through the solar thermal collectors (glycol), a heat exchanger transfers the heat to water (like boiler type system) and heats the house. It can also be used to heat your water. They estimated my cost to be $32,000 for this system. 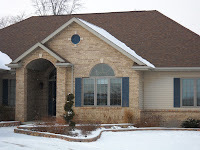 (about a 2500 square foot house at that time, which slowly increased in size as the design process progressed. It is now 3000 square feet). Tax credits include a Wisconsin Focus on Energy tax credit of $1722, and a Federal Tax credit $9307, bringing the cost down to about $21,545. Estimated maximum annual savings for water and space heating were estimated at $2580 at today's costs. After tax credits, that would give a return on investment of about 8 years. I decided against this option after seeing it in a house on a Parade of Homes. Besides the cost, I wasn't so sure about having a huge tank of water in my basement. Also, I would still need to purchase an air conditioning unit. Wow! At long last, I've signed the official contract with my builder, James Mathusek from Gallery Homes. I did this during the past week, on 1/11/11 (a nice date, I think). If anyone is wondering, I actually had them start on the house before I had all the details worked out, so that they could get started. I wouldn't recommend this on a routine basis, but its the way it worked out in my case. The builder plans to use the house in the Parade of Homes for the Winnebago Home Builders Association at the end of April and I want them to have plenty of time to build. It was kind of scary to sign a big house contract, too--all by myself, no less. I so wished my husband was there! I was so accostomed to him doing all the negotiating and the bargaining and working out the details. He was so good at it too! I have what I hope is a fair contract without any hidden loopholes. I feel like such a neophyte at this and a lot of what I call "builder speak" goes over my head. I have had a whole lot of anxiety over much of this. For awhile, I was getting paralyzed by all the decisions I had to make and the worry that I would make the wrong one. I went on a spiritual retreat in November (which I do every year), and what I came away with after meditating on this for a bit was this: Its OK to make a mistake. Things can be changed and corrected as I go along. In my own job as a nurse practitioner, if I make a really bad mistake, someone can actually die. That won't happen in this case. The reassurance that I could reassess and redo things as I go along, gave me the courage to go forward with the contract and with the house even if it has flaws. More on the long road to actually signing a contract later! Caroline was my accomplice over the last couple of days in driving around upscale neighborhoods as we took pictures of houses we liked. She came up with the phrase "drive by shootings" for this activity as I drove the PT cruiser and made her get out and take the pictures. We were a little nervous that people would think us suspicious. No worries though, no one stopped us. 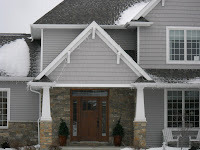 I am specifically trying to come up with a color scheme for the exterior of the house. This is a challenge as there are several elements to this. Like many houses, the front will be fancier than the other sides. However, the challenge of having a house on the lake is that there are really 2 fronts--one on the streetside and one on the lakeside. The architect came up with a multi-media compilation for the exterior. 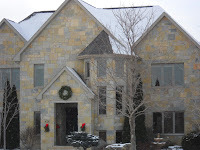 The front will be stone and stucco, and the other sides will include vinyl shake with some stucco and stone. In the world of green building, the ideal would be to have materials on the exterior that can be recyled at the end of their lifecycle. I have some experience with this now since I did tear down my old house. On the old house, the siding was wood, which Winnebago county recycles automatically at the dump (it recycles/chips any wood). Overlying the wood siding was some relatively new vinyl siding. This is one of the hardest material to recycle. It can be done though. There are companies that use it in making PVC piping, and other products. I could find no companies in Wisconsin that would do it without charging a hefty price for taking it down and transporting it. I also asked Habitat for Humanity about it. They rely on volunteers and didn't have any volunteers to do it. In the end, the house stood abandoned long enough for some unknown person to come along and take it--a version of "one man's junk is another man's treasure". In my ideal world, I would have a house of entirely brick, stone as they are natural materials and are easily recyclable, durable and require little maintenance. However, they are the most expensive. Also, brick is expensive to produce and has a high carbon footprint during its production. 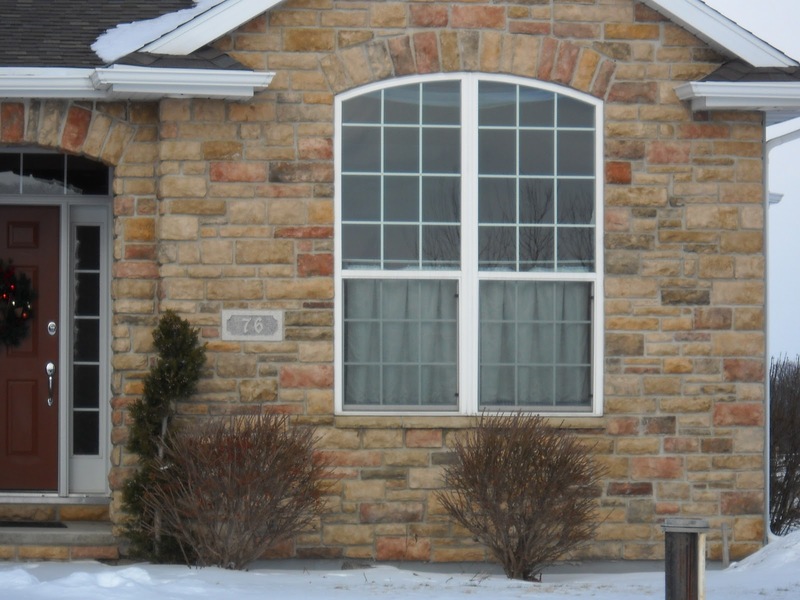 Another reasonable option is modern day stucco which is a product known as EIF: exterior insulation finish. It is moderately expensive. 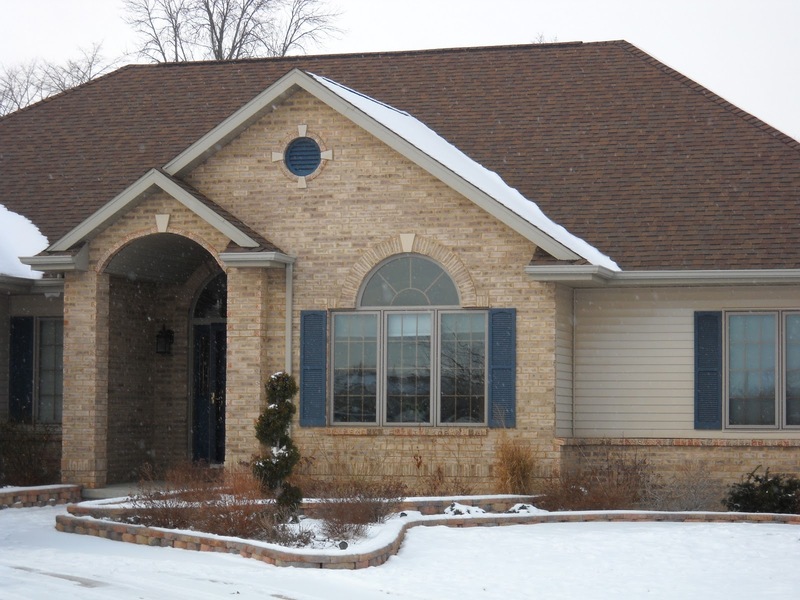 It is less expensive than traditional stucco, though, and adds insulation to the exterior of the home. They can make it look like stucco, brick, or a smooth stone. It has an R value of about 12. A common brand name is Dryvit. It can be repainted and has its listed as lasting 25 years although in reality, it usually lasts even longer. It is made of recycled materials and the waste can be recycled too. Another natural option is wood siding--moderately expensive, requires maintenance, and attracts pests, but its beautiful. There is another new product out there too--fiber cement board. Its made of sand, cement and wood pulp. It takes a lot of energy to manufacture it, and its heavy, but durable. 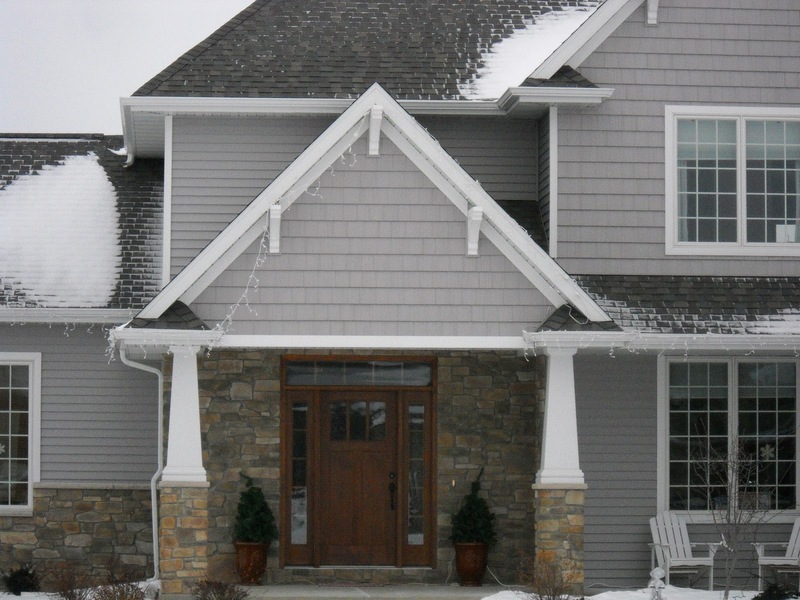 The cheapest option is vinyl siding which is why there is a lot of it. I will be using some of it on my house (a product called Cedar Impressions vinyl shake). This is produced by a company called Certainteed; they use 60% recycled content in their products. That's all for now. I will try to attach some pictures of my favorite stones. 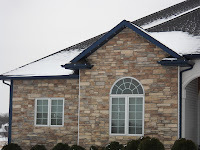 I would like to use a stone that will match with blue trim and or siding, neutral/light brown or tan stucco and/or siding. The 2 houses to the north of me have gray siding which is why I don't want to go with gray,even though it matches with a lot. Give me your opinion. I had a hard time with the pictures. Thats why they are randomly placed. Have a great day! 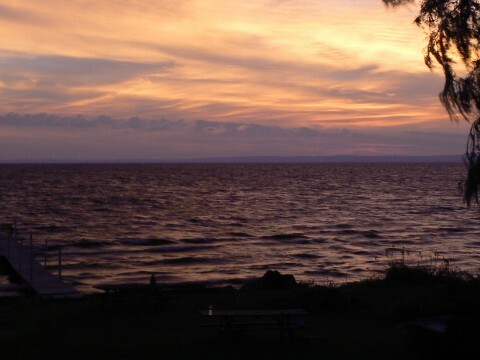 ﻿I have lived on the shores of Lake Winnebago in the town of Black Wolf (so named because of an Indian chief by that name whose tribe lived in the area) for about 20 years now. 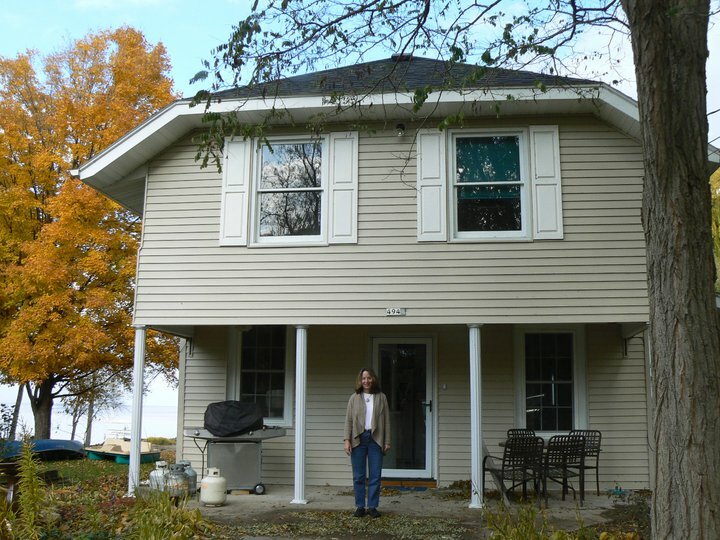 The house on the property started out as a cottage in about the year 1920. Various additions were made over the years in a hodge podge, amateurish fashion. 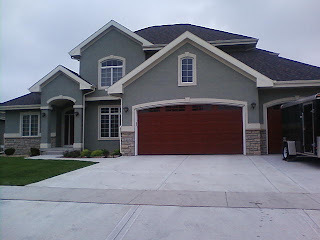 Sometime along the way, a large detached garage was built too. Although I have loved living on the lake, and I cherish the memories of all the good times in the house, the house itself had many flaws. It lacked a good floor plan, insulation, the floors sagged, the pipes in the kitchen froze every winter, several rooms were unable to be heated, and it could best be described as quaint but certainly not beautiful. ﻿﻿﻿﻿ I had thought for years about building new, but never had the impetus to do it. My husband Rory and I began discussing it more earnestly when he became ill with cancer and was having trouble climbing the steep stairs to the second floor. We began looking at some floor plans and talking with some builders. Unfortunately, he passed away before we got much further than making some preliminary discussions about a new house. I know he wanted me to have new house that would be easy to take care of too. 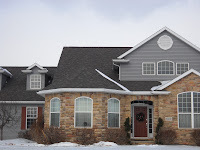 Rory had the incredible ability to fix just about anything that goes wrong in a house, but he knew that I would need something that required less upkeep than the old house. I decided to keep going with the plans to build a new house once Rory had passed away. 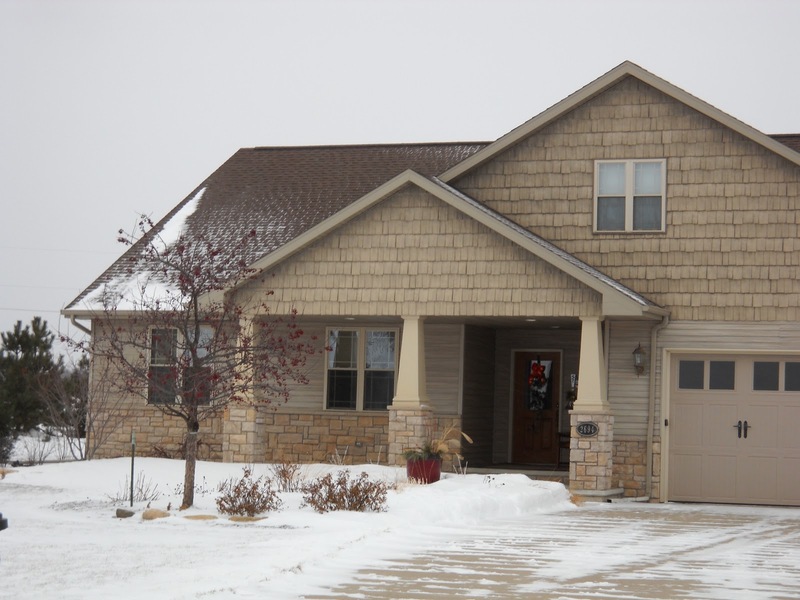 It gave me something to do besides mourn his loss, and gave me a reason to move to my sister's house in Neenah where I was surrounded by much love and support. I decided if I was going to build new, I was going to build green. Thus the project started.